John McCosker of the California Academy of Science has described a new snake eel from a single specimen trawled off Durban in 450-460 m. Although this depth makes it unlikely that any of us will ever see the species in its habitat, it emphasizes how much there is still to learn about our fish fauna and how non-scientists can help by collecting or photographing unusual fishes and giving them to scientists working on marine fishes. The snake eel was collected by Grant van der Westhuizen aboard F/V Ocean Spray using an otter trawl and passed on to SAIAB by Sean Fennessy of the Oceanographic Research Institute in Durban. The new snake eel is easily separable from known snake eels on the basis of the eye position and size its reduced vomerine dentition (single tooth) and its extremely elongate body amongst other characters unique to the genus. The elongate snake eel Luthulenchelys heemstraorum that was trawled off Durban. Drawing by Beth Herd Guy. McCosker said that this elongate snake eel was so different from other species that he had to describe it as a new monotypic genus and species. This new genus Luthulenchelys is named in honour of Chief Albert John Mvumbi Luthuli of KZN, Africa's first winner of the Nobel Peace Prize and a former President of the ANC; and enchelys, an ancient Greek word for eel. The species heemstraorum is named for Phil and Elaine Heemstra of SAIAB in recognition of their efforts to understand,illustrate and explain the fishes of the Indian Ocean to scientists and the general public. Ricky Jacobs of Mozambique Tours sent Simon Chater of uShaka in Durban two photographs of an unusual female shark caught by his son Shaun in Mozambique (Bazaruto) last year. Simon forwarded them to Phil Heemstra of SAIAB. At the time Phil was not totally sure of his identification because he was only sent the two photographs above and right. However, thanks to serendipity - an adult male that Lucy Scott brought us from Sodwana a month later - Phil was able to confirm an identification for Shaun’s Bazaruto shark. It was the rare white-edge weasel shark, Paragaleus leucolomatus. The Bazaruto female is the 2nd known specimen of this species. The third known shark (from Sodwana) was caught by André MacDonald south of Jesser Point where he was helping Lucy collect fish for a study on the fishes of the Sodwana Bay canyons. This fish is the second specimen in the South African Institute for Aquatic Biodiversity (SAIAB ) fish collection, the only male, and is 928 mm TL, weighing 2.43 kg. 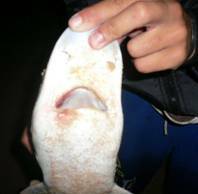 The acuminate (tapering to a point) fins, large rounded snout, small teeth and most fins whitemargined are characteristic for this species. The 2nd dorsal fin has no white margin but it has a blackish apex. The white-edge weasel shark was previously known from a single gravid female caught off Kosi Bay. The distribution range has now been extended from Bazaruto to Sodwana Bay. The male white-edge weasel shark Paragaleus leucolomatus caught off Sodwana Bay and donated to SAIAB by Lucy Scott. This view shows the blackish apex to the 2nd dorsal fin. The brown body colouration is due to preservation.